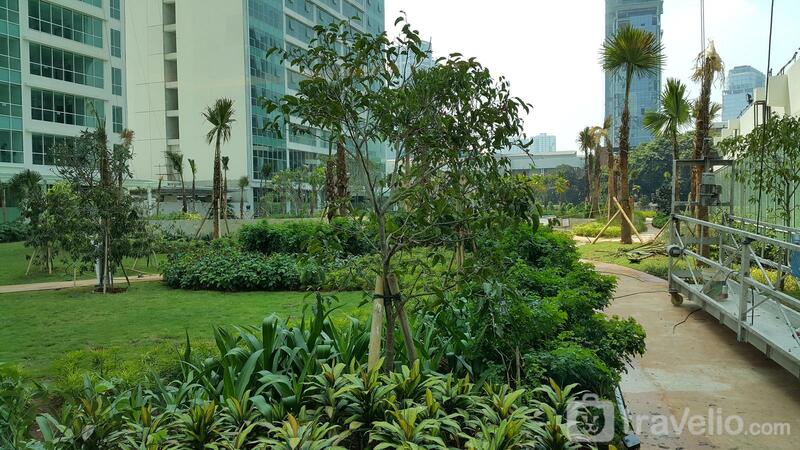 This apartment located near to business centers such as Bank Mega Kuningan Tower which is 2 minutes away; 6 minutes driving (2.2 km) to Allianz Tower; 9 minutes walking (700 m) to Plaza Kuningan; and World Trade Center Jakarta is 1,5 kilometer away and could be reached by driving for 7 minutes. Public transportation Access such as Halim Perdanakusuma Airport could be reached by 24 minutes driving (13.1 km); 6 minutes driving (2.6 km) to Sudirman Commuterline Station, and Karet Kuningan Transjakarta Bus Shelter is 7 minutes away (500 m) by driving. Setiabudi One Mall could be reached by 5 minutes walking (400 m) from the apartment building. Moreover, famed-Jakarta shopping malls such as Epicentrum Walk (Epiwalk), Kuningan City, Plaza Festival, Citywalk Sudirman, Ambassador Mall, FX Sudirman, Plaza Semanggi, Pacific Place, Lotte Shopping Avenue, Grand Indonesia Mall, and Plaza Indonesia are less than 15 minutes away by driving. Another entertainment options are Gelora Bung Karno Sports Complex and Satriamandala Museum which could be accessed by 18 minutes driving (6.9 km); 20 minutes driving to National Monument; Suropati and Menteng Park could be reached by driving for 6 minutes (2.6 km).